Jon Hanna: Tell us a little bit about the two new books that you are currently working on. 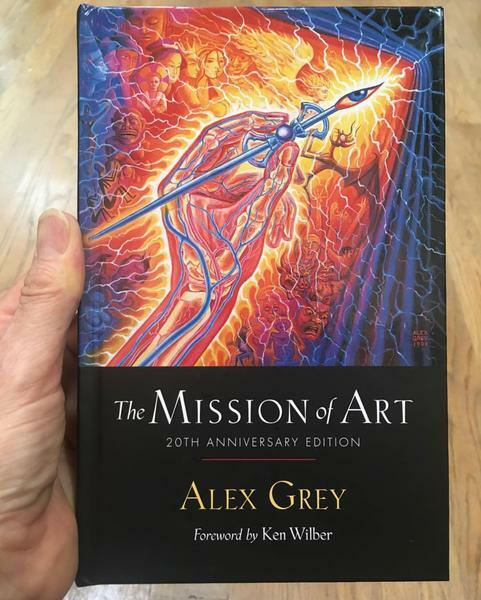 Alex Grey: In November 1998, The Mission of Art was released by Shambhala Publications. The Mission of Art is an inspirational text for artists and anyone who has glimpsed the spiritual power of art. It traces the evolution of human consciousness through art history, seeking the threads of art's mission. I explore the development of my own work, including the bizarre performances and entheogenic experiences which lead to my visionary art. There are reflections on the artist's intention and conscience, and how we of the postmodern age can use the creative process as a spiritual path. I call it my philosophical art rant, a neo-platonic manifesto. There's also about 60 b/w reproductions of drawings and paintings, many of which were done specifically for The Mission of Art. The other book will be a large format artbook with lots of color plates and will be entitled, Transfigurations . It will not come out for another year or so. It's basically the next batch of works including performances, sculptures, paintings and drawings I've been doing since Sacred Mirrors . Jon: Much of your early work consisted of performance art. Do you still do any performance art, or is your work now focused predominantly on painting? 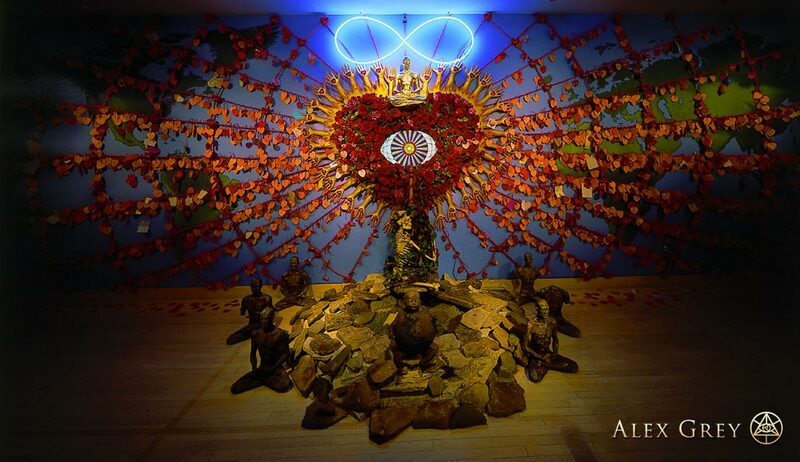 Alex: Although the performance rites and installations are few and far between now, Allyson and I completed a major installation called Heart Net at the American Visionary Art Museum in Baltimore. 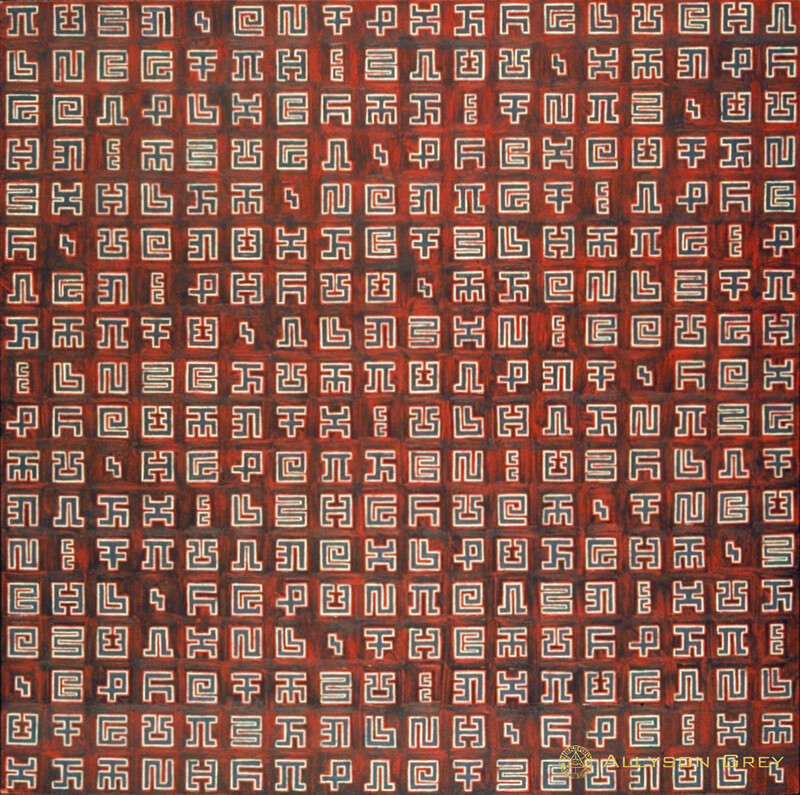 It is included in a huge group show about LOVE that opened in May of 1998 and will be on view until May 1999. It was created from a vision I had on 2CB. Thanks Sasha! It's an alchemical healing piece, the length of the wall is 10 feet by 60 feet and is painted with a map of the world over which a red rope web radiates from a gigantic heart formed from hundreds and hundreds of silk roses. An eye in the heart is crying into a small stone grotto surrounded by broken buddhas. Under the heart a black skeleton and a white skeleton are embracing and an earth child has crawled out of the grotto. 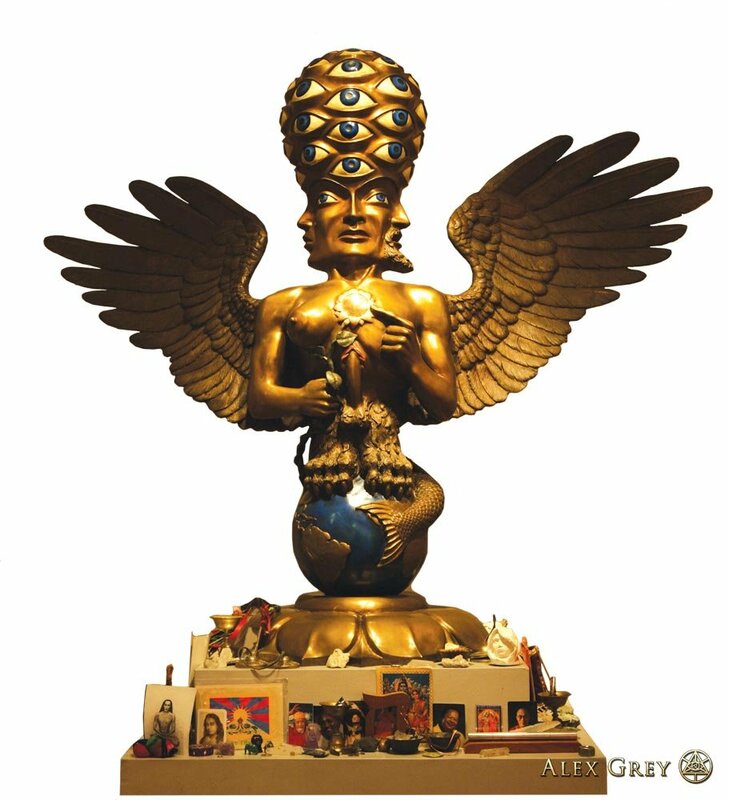 Above the heart is a golden buddha, and above the buddha is a white neon infinity symbol, and above the neon is a tiny naked embracing Ati-Buddha sculpture. The Heart Net is an audience participatory piece that invites people to write a healing prayer or loving message on a small paper heart and tie it to the rope net. The Heart Net has thousands of prayers and messages on it now, and it's really incredible to read some of them. Everything from cynical dirty limericks to children scrawling love notes to their mommies to people expressing passionate and spiritual regard for each other and the planet. But to answer your question, I am mostly painting and sculpting these days. It seems that the performance energy has gone into public lecturing on my work. I've done a number of talks at art, spirit or entheogenically oriented conferences. Jon: You created, and for a time sold, a device called "The Mindfold," which was essentially a blindfold and earplug combination that could be used for sensory deprivation while tripping. What are the benefits from using such a device while experiencing entheogens? Alex: The removal of distracting visual or auditory elements allows for a blank screen onto which the imagination can be projected. There is a more complete immersion inward which becomes potentially more frightening and miraculous. The Tibetan Dzogchen Buddhist practices include a "dark retreat" called Yantig. The idea is to hallucinate and yet, not to get caught up in the imagery, to realize that it is only a projection of your mind. Just like the rest of this magnificent display of reality. Jon: Back when I was working on my BA in art, I had an assignment where I had to give a presentation on some unique aspect of modern art. I proposed a talk on the influence that psychedelics have had on art, and my instructor vetoed the idea, telling me that it was too controversial. What type of obstacles or resistance do you run up against as an artist who is candid about the important influence of visionary plants and drugs on your work? Alex: My work scares some people because the Divine Imagination can be a scary place, which anybody who has tripped knows is true. It's not only that you see scary monsters, or experience your own death, or dissolve into a network of infinite light, but that such all enveloping visions severely challenge any conventional "non-mystical, non-visionary" worldview. Anyone who admits the existence of these boundless inner dimensions realizes they have profound implications about what we believe reality is. Blake and other visionaries knew these dimensions first hand and now with LSD and DMT nearly anyone who has the guts and the curiosity can be introduced to some aspect of the terrain. But we have to remember that during his day, Blake was regarded by many as totally mad. Part of the problem that the "legitimate" art world has with my work is that many critics still feel the postmodern deconstructionist agenda is the only hip concept for art to deal with. These intellectual fashion trends change every few years. When I was a student, minimalism was the rage, so content or imagery of any kind was verboten. My answer was to bring rotting dogs to class, set my underarm hair on fire, and vomit on human brains. Stuff like that. Also, visionary artists encounter resistance based on our culture's entrenchment in materialism and what Ken Wilber calls a flatland mentality. Flatlanders deny that reality has height and depth, deny the importance of the subjective interior states that determine meaning and value. My work attempts to integrate many spheres of inquiry such as science, art and religion which are seen as the primary causes of fragmentation in modern society. My strategy runs counter to the nihilism and narcissism of much art today. Alex: Well, I actually think that there are quite a few visionary artists whose work reflects these states, it's just that you don't see their works that often in the museums and trade rags of mainstream contemporary art like Art In America , Art News or even Artforum. World Art, Raw Vision and Juxtapoz are a few more daring art magazines which sometimes will feature articles on artists inspired by the psychedelic state. Many entheogenically inspired visionary artists have shown up on the web or magazines devoted to the subject of consciousness expansion. But most artists are still frightened to talk about "it", because of the draconian legal situation. As far as the art market goes, you need collectors to sustain any kind of art with real vitality. Remember, without his generous brother Theo, Vincent Van Gogh might never have had the time and materials to create his works. Are we glad he did!? You bet! Many of the wealthy collectors of Pop art and media inspired art have made their money in the advertising industry. The life and art vision they invested in reflected their state of consciousness, the sense of an empty package, and usually totally bereft of spiritual or visionary qualities. Yet these generous people have helped build our museums, they have given back to their community. It's shocking to me to see how few wealthy drug inspired or "new age" or "alternative lifestyle" people ever think of buying an original piece of art. It takes a "head" to recognize a "head". The visionary psychedelic artists are largely unsupported artists, struggling to gift the world with higher vision. So if you can, buy original art, my friends. And thanks so much to those generous patrons and collectors who have helped in the past. And please, if any of you well intentioned Rave promoters who have ripped my work off mercilessly are reading this, consider running a credit line or for God's sake sending me a check for your image theft. If you think I am well off like Picasso was, you are wrong. Artists deserve to be paid for their work, not ripped off. This past summer I met some intense young artists from Baltimore, poor as anything and they are total acidheads. Their work is fabulous. I'm not concerned that the vision will ever die. It will keep emerging through us dedicated mystic artists. Brothers and sisters, keep making art. Some day soon I hope this kind of work will be more appreciated. I think that the whole computer animation industry is filled with drugged out hippies making corporate logos that glow and flip and become transparent. Occasionally you will see an ad campaign visualized by someone who has obviously tripped. It's good to see that they can earn their daily bread, but I wish they could make computer animated sacred art as well, and not just prostitute out the special effects for laundry detergent and soft drinks. That's my sermon. Jon: Your work is technically precise, and I imagine that most of your paintings that are based on visionary experiences were executed *after* the experience, not during it. Have you ever painted while in a visionary state, and if so what was this like? Alex: Myron Stolaroff recommended really low doses of acid as a catalyst for deepening meditational experiences, and this practice may have merit for painting in my focused way. I have some friends who take a substance and then set down to draw. One of the most fun art-things to do while under the influence is to draw large spirals. I start drawing the outside circle and wind my way in. By the time you reach the center, your mind has been flushed, drawn down the purifying art toilet to the other side of the universe. Jon: There is currently in this country, a great worry about young people and "drugs." As a father, and as someone whose work exemplifies the *positive* aspects of drug use, what approach do you take when discussing drug use with your daughter Zena? Alex: We try to be totally honest, and educate her, but not burden her with information that would be beyond her understanding. She has seen my art lectures. I don't encourage anyone to do drugs. 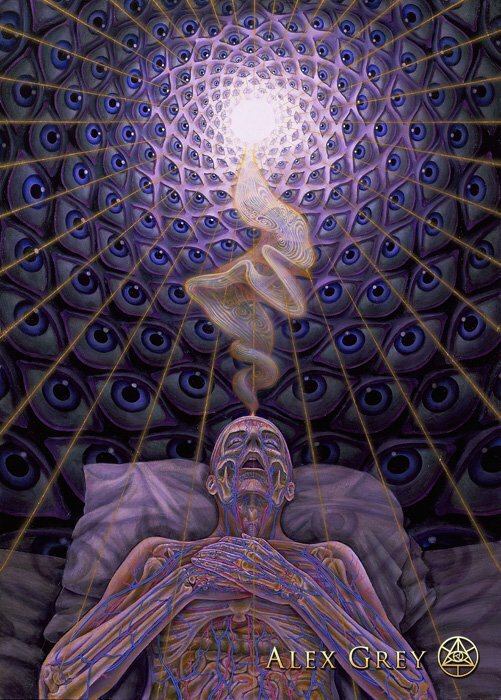 But when I talk about my art to various audiences, I do mention my personal entheogenic experiences, such as dissolving into the Universal Mind Lattice, becoming one with all beings and things in a network of love and light. Such mystical experiences which I had some time ago, had a positive influence on my art. We were recently in Amsterdam and Zena met Dr. Albert Hofmann. She loves Huichol Art, and we buy what we can of it. There are alot of dangers associated with the entheogenic spiritual path, the worst of which are legal. I don't think that young kids should be doing drugs. They should be forming their identity, strengthening their ego, not dissolving it prematurely. Jon: One of the things that I like about your work is that it embraces both the archetypal and the personal. Many of your paintings address basic human conditions that everyone can relate to; love, birth, life and death. Yet your paintings are also obviously pulled from your own life experience; the joyous love that you share with your wife, the birth and growth of your daughter. Alex: Indeed, my wife recently pointed out to me that she could see your face in a number of your paintings. While it has been said that all artists' work contains self-portraits (whether intentional or not), it is quite unusual to realize that you can recognize the face of the artist without his skin! To what extent to you intentionally try to accurately portray yourself in your work? I think that the best art is a direct expression of the artist's deepest personal and transpersonal experiences. Jon: A number of your paintings contain the "disembodied eye" motif. This seems to be an archetypal image that numerous people come across while in a visionary state. Why do you suspect that this theme is so common? Jon: I remember in my youth, when I was first introduced to LSD, a few people emphatically told me, "Don't look in the mirror." Seemingly, they were trying to prevent me from having a bad trip. In retrospect, I suspect that perhaps these people weren't too comfortable with themselves. 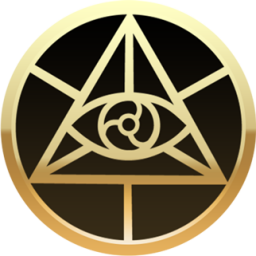 Do you feel that *actual* mirrors can be put to good use while in the visionary state, and if so in what manner? Alex: I remember looking in a mirror during several different trips, and even did a couple self-portrait drawings. Once as I was staring into my own eyes, with enormously dilated pupils, I noticed the light glisteningly reflected off my wet eyeballs. The light began to grow larger slowly burning away my eyes and face, leaving only a field of electrically charged white light. It was somewhat frightening to dissolve into the light, but my body would reappear every time I blinked. Definately lose yourself (your small self) in the mirror, but it's always nice to have a loving friend along. Allyson recalls looking into the mirror as she was meditating in a lotus posture and seeing herself as the Buddha. That's a good one. But if you are coming down from a bad trip and you've been mentally slogging through a field of rotting corpses, maybe it's not the best time to look at yourself in a mirror, because your judging negative self is in full command. The Sacred Mirrors were created to use this mirroring aspect of the mind, and to be experienced in a heightened state. I feel that they can help realign the body-mind with spiritual energies. Jon: What are your thoughts on specific plants or drugs that are conductive to visionary states that can be brought back and represented through painting? Are some entheogens better than others for this work? Jon: Why do you think that many people in Western society have such a hard time incorporating the visionary state and direct experience of God into their lifestyles? Alex: BECAUSE GOD AND THE INNER VISIONARY WORLD IS NOT EVEN SUPPOSED TO EXIST! GOD CAN'T BE SEEN AND VERIFIED WITH A TELESCOPE, AN OSCILLISCOPE, OR A MICROSCOPE...CAN'T BE BOUGHT AND BROUGHT HOME FROM IKEA...SO IT DOESN'T EXIST, IT DOESN'T EXIST "OUT THERE"...BUT IT CAN BE KNOWN, IT CAN BE KNOWN, AND THE MILLENNIA OF MYSTICS PROVES THAT! People can smell a threatening worldview from pretty far away. Mystics don't have an easy time of it, so folks try to avoid the mystics life, even though it does hold the promise of ultimate liberation. Jon: In a number of your paintings, such as *Prostration*, *Despair*, and *Deities and Demons Drinking from the Milky Pool* I notice imagery that is reminiscent of Hieronymous Bosch. What painters do you feel have influenced the stylistic direction that your work has taken? Alex: My father, an artist himself, was my first influence. He encouraged me to draw. Then I fell in love with Michelangelo when I was a teen. His Neo-Platonic idealism wed with gothic Catholicism is very tripped out. Michelangelo's obsession with the struggle of body and soul is very related to my work. Other influences would include Tibetan and Hindu Tantric art, Bosch, Rembrandt, Blake, Van Gogh, the Belgian Symbolist Jean Delville, Pavel Tchelitchew, Ernst Fuchs, Jackson Pollock and especially my wife Allyson Grey. I still love Dali and Francis Bacon, hell, I'm an eclectic art lover. I put the portraits of numerous influential master artists, hovering over the painter, in my recent painting called "Painting". Jon: Who are some modern artists that incorporate the use of visionary plants and drugs into their work that you feel are worth keeping an eye out for? Alex: One of my favorite artists of the 20th century is my wife Allyson, and her abstract spectral geometric spaces have great depth and evoke the spaces of psychedelic Tantrism. I recently met Albert Hofmann and he said that Francesco Clemente, a very well known and well respected contemporary artist had sought him out to thank him for the visions. His work is wonderful and something like a contemporary Redon. Keith Haring wrote to Timothy Leary about the importance of LSD in developing his trademark drawing style. Decades ago Henri Michaux did a number of works inspired by mescaline, but his work is not in the visionary tradition, it's more abstract expressionist Tachism. Good mescaline visions came through the lady who did the Crowley Tarot deck. The painter Pavel Tchelitchev, although I don't think he ever used drugs, is one of the most tripped out painters of the 20th century. Ernst Fuchs and Mati Klarwein have used entheogens, and their surreal-fantastic-visionary paintings are some the best and unbelievably detailed models of good tripping visions. Diana Vandenberg and Johfra Bosschart are Dutch visionaries that blend surrealism and occult tripping visions. Joseph Parker is one of my favorite little known visionary painters of the 20th century, he suffered from intense migraines and got his visions of heaven realms during those periods. His sunsets look like the kind of stained glass persian rug jiggley-jewel skies I've seen on mushrooms. I came across the work of Erial in an old Psychedelic Illuminations magazine. He's got the DMT Being thing down. Of course let us never forget the Huichols with their amazing bead and yarn work and also, Pablo Amaringo and his crew of Ayahuasca inspired artists down in South America. 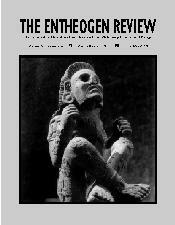 Jon: A frequent theme that runs through the pages of The Entheogen Review is the idea of encounters with "discarnate entities." Your own work occasionally pictures imagery that falls into this category--what Terence McKenna might call "the other." Frequent descriptions of these "entities" portray them as being "insect-like," "elf-like," or even "alien-like" (in the traditional "Man from Mars" sense). What are your thoughts about the existence of these beings? Alex: "There are more things in Heaven and Earth than are dreamt of in our puny philosophies..." My thoughts on those buggers don't count, if you've experenced them in one form or another, and I have, then you accept that they are part of the inner mindscape. Of course, some astral neighborhoods you avoid if you possibly can, because there are some malevolent jerky kind of spooks that just love to mess with your head. Of course, "the other" is a weird delusion of Samsara, the dualistic world we take for reality. My worldview comes more out of a sense of Oneness, Infinite Oneness. The astral creepycrawlers are just part of the One. They do their job, they reflect our minds scarey creativity. 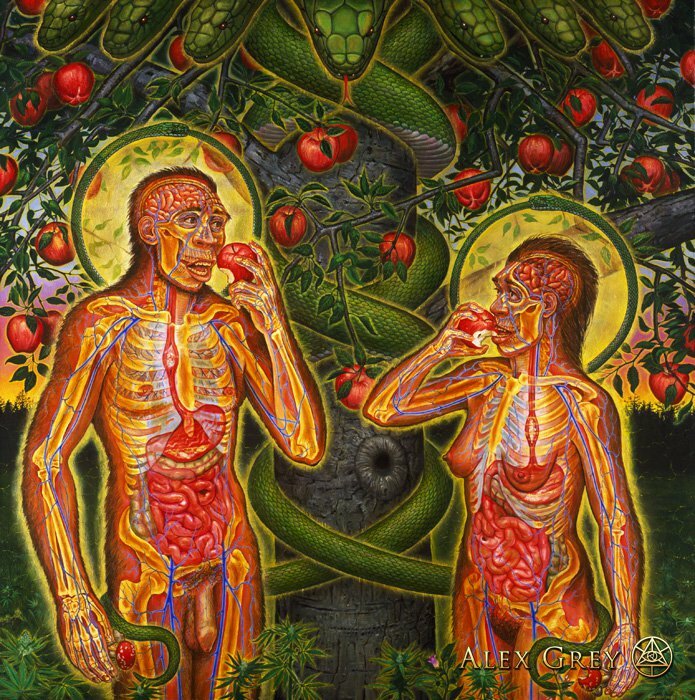 Jon: Your web page, www.alexgrey.com mentions plans for a chapel that may someday be built to house your work. Can you tell us a little bit more about this idea, and when it might come to fruition? Alex: We know the Sacred Mirrors are beloved by thousands of people who have seen them installed at one of various venues throughout the United States and Canada or who have purchased one of over forty-five thousand copies of the book, Sacred Mirrors, The Visionary Art of Alex Grey, now translated into five languages. We receive letters and e-mail daily from people who have gotten great value out of the Sacred Mirrors and have questions about where they could be visited. This has prompted me to seek a way to make the works available to a wider public, hence, The Chapel of Sacred Mirrors. I have retained the Sacred Mirrors for the sake of realizing the Chapel project. In addition, numerous collectors of my work have promised to donate significant works to the Chapel when it is built. A secular art gallery or museum is not the proper place for spiritual art. In order to work most effectively, spiritual art requires a sacred setting. The sacred art and architecture of previous cultures have always been sites of initiationinto their unique and culturally bound understanding of spiritual reality. The tribal myths and dogmas that keep religions at war are not the mystical truths at the heart of each religion. Today, a more embracing and universal spirituality is possible. The Chapel of Sacred Mirrors would be dedicated to fostering such interfaith and post-denominational spiritual understanding. As the millenium dawns, I feel it's important to build a new type of sacred space with both a personal and planetary perspective. I envision a Chapel of transformative art that aligns the individual self: body, mind and spirit, through contemplation of the Sacred Mirrors, then presents a deepened understanding of archetypal human relationships via the Progress of the Soul paintings, Praying, Kissing, Copulating, Pregnancy, Birth, Nature of Mind, Theologue, Transfiguration, World Soul, and Godhead. These and other promised gifts would fill the Chapel with an extraordinary collection of important artworks providing a holy context for the human journey from conception to death. 1. Procure a site of beauty accessible to a wide audience. 2. Build and landscape the Chapel. 3. Maintain and perpetuate the Chapel. We are in the beginning phase of the Chapel project and seek feedback and support of any kind. If the Sacred Mirrors have been important to you, please write to us and give generously if you can.